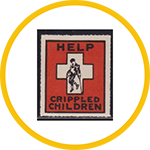 Easterseals has only been able to pursue its mission of empowering people with disabilities and special needs over the past 100 years because of supporters like YOU. Together we’ve made incredible progress, serving over 5,000 individuals last year alone. However, this is only the beginning and it’s time to focus on what we hope to accomplish over the NEXT 100 years. Please pledge your support to make sure persons with disabilities and special needs are guaranteed a future where they are 100% empowered and 100% included. If your business or community association is looking to make a meaningful impact on their community, we hope you will consider partnering with us for our 100th anniversary. We have a variety of sponsorship and volunteer opportunities which can mobilize your staff and inspire your customers. We are also looking to partner with hospitals and managed care organizations to address the social determinants of health affecting those with diagnosed mental illness. Let’s work together to cut healthcare costs and improve outcomes across the board. There is nothing more powerful than a community of connected and engaged advocates sharing the same, singular message, “We want change the way people with disabilities and special needs are defined or viewed.” By connecting with us and sharing the stories of success we’ve gathered over the last 100 years of service, you can do just that. Find out how you can amplify your voice by signing up for our online newsletter or by engaging with us on social media. 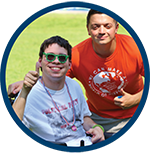 If you or your loved one is looking for supports to live, learn, work, or play in their communities, please review the services we provide to see how Easterseals can help make a difference in your lives. 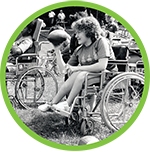 For the past 100 years, Easterseals has dedicated itself to providing services that assist people with disabilities and special needs to overcome barriers and achieve their goals. 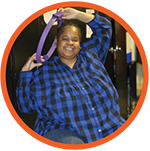 We empower our program participants to turn an inaccessible world into one where they can live their lives to the fullest. 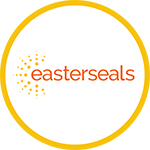 The first "seal" (stamp) is created as a fundraising campaign for our organization & was so popular that it was later included in our brand identity, including changing our name to Easter "seals"
"Easter Seals" name modifies to create a new, re-imagined, single name, "Easterseals"
We take great pride in being the voice of advocacy helping to bring equality, dignity, and independence to people in need for 100 years…and for the next 100 to come!